Only the TIF's base AV revenue continues to go to school districts. If all 1,308 Tax Increment Finance (TIF) districts in Illinois were to expire this year, local public schools would receive a significant windfall in new property tax revenue, although the new money would be partially offset by a reduction in state support under the general state aid formula. That’s the belief of TIF expert Rachel Weber, an associate professor in the Urban Planning and Policy Department of the University of Illinois at Chicago. She made the observation in a letter published March 25 in Crain’s Chicago Business in response to a series of columns that defended TIFs against the charge that they harm schools and other local government entities. Tax Increment Financing (TIF) is an economic development incentive program that municipalities can enact under provisions of a state law to facilitate the continued development or redevelopment of a specific geographic area. The program works by capturing increases in property tax revenues (called the increment) over existing levels as caused by new development. Revenues from property tax increases that result from new development are placed into a TIF fund, which may be used to pay for public improvements. TIF revenues can be spent only on certain public investments. A TIF district does not, however, add any new tax rates or levies. In most cases, existing baseline tax revenues continue to go to the taxing districts for at least 23 years after a TIF is created. Weber’s letter was directed at comments published by Crain’s political columnist Greg Hinz, who had suggested that Chicago schools ultimately are no worse off with TIFs than without them due to effects of Illinois’ property tax extension limitation law (PTELL) or tax caps. If no TIF district had ever been formed, he argued, the school district would have had to lower its tax rate to accommodate the expansion of its tax base and forego any budgetary increase. But Weber said that argument disregards a key fact; that new construction is not subject to the PTELL tax cap. “When a new office tower or condo building is constructed outside of a TIF district or in the absence of TIF, overlapping taxing jurisdictions can include the value of those new buildings in their base without triggering the PTELL cap. The taxes from these new buildings are exempt from the cap,” Weber explained, adding that when new buildings are constructed within a TIF’s boundaries, on the other hand, schools are not able to gain revenue from the property taxes paid on the building until after the TIF district expires. That is, unless the school districts involved have negotiated an agreement to largely be held harmless from the local TIF’s impact, as more and more school districts are doing these days. Such agreements are necessary because the state law on TIFs — the Tax Increment Allocation Redevelopment Act (65 ILCS 5/11-74.4-1 et seq.) — does not include a mechanism for preventing or penalizing abuses of the statute by municipalities. Nor does the law in Illinois, unlike some other states, give school districts much power in the TIF-creation process. Schools must adopt a proactive posture to ensure fair treatment regarding property tax allocation. Most say it comes down to getting informed, collecting data, and/or challenging data supported by developers. School districts also can participate by negotiating as active participants in the TIF process, as opposed to maintaining all-out opposition to the proposed TIF or a proposed extension of the TIF time limit. Since municipalities have the final say in TIF creation, it often makes sense for schools to negotiate. The negotiations can be extremely lucrative because TIFs can tie up an immense amount of revenue that schools might otherwise receive. Throughout Cook County, the state’s most active county in terms of TIFs, $644 million in revenue was collected in 434 active TIF districts just last year. One recently expired downtown TIF in Chicago’s Central Loop collected nearly $1 billion during its lifetime; another in the Near South neighborhood collected $637 million over its history, according to a July 14 report by David Orr, the Cook County Clerk. A summary of Orr’s annual report on Cook County TIFs is available here. Orr says revenue from a total of 286 suburban-Cook TIF districts increased by nearly 4.3 percent, or $261 million in 2013 to $272 million in 2014. In fact, six suburban Cook municipalities collected more than $10 million in TIF revenue just last year: Rosemont ($38.9 million), Glenview ($32.1 million), Hoffman Estates ($28 million), Cicero ($13.8 million), Oak Park ($10.6 million), and Palatine ($10.1 million). Some school districts and other local governments have been able to sign inter-governmental agreements (IGAs) with municipalities that allow them to share in the new property tax wealth available in TIF districts. 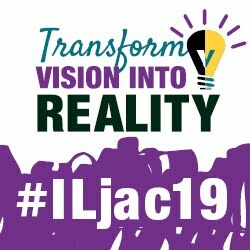 Individual school districts, library districts, and other taxing bodies are free to negotiate their own deal structures with municipalities within the context of the state TIF legislation. School districts generally seek agreements granting them a percentage of the TIF increment money or other money the TIF generates. The Village of Oak Park, for example, signed an IGA with its local school districts to provide that specific properties be “released” from TIF districts as the properties are developed each year. The developed parcels are added back to each school district’s respective tax base to generate revenue for local schools. A similar agreement was signed in June by Park Ridge-Niles School Dist. 64 and the city of Park Ridge. Under the new plan, the Incremental Property Tax Revenue (IPTR) for one downtown TIF will be multiplied by 13.46 percent, resulting in a total close to what is needed to offset costs. Starting with revenue from 2016 property taxes, the annual payment is expected to total $360,000 for the schools. The city would make up the difference as 2014 and 2015 property taxes are collected. Maine Township High School District 207, Park Ridge, is negotiating another such agreement, with much the same provisions as District 64’s. It, too, is designed to share in the same IPTR. For more information, see the news report online here. These kinds of agreements can help offset some of the negative impact of TIFs on the property tax revenues of school districts. They do not, however, always make the schools “whole.” That is, the rebated portion of the TIF is seldom equal to the sum of the jurisdiction’s tax rate applied to the incremental EAV in the TIF district. It is important to note, Weber and other researchers have stated, that funds rebated to schools under IGAs are not considered part of the available property tax collections for the purposes of calculating general state aid to schools in Illinois. Which means school districts can obtain compensation from both the state and the TIF for revenues lost under terms of the TIF. • The district might also seek reimbursement for revenue to be diverted to the TIF fund, and may seek "payment in kind"
• Know every developer’s motives. Developers want to maximize their return. They achieve this by convincing others to mitigate the developer’s risk by investing and whenever possible, avoiding a personal guaranty. Your role is to make sure that the TIF investment is necessary, secure, and shows potential for success. • Know your local market potential. Keep track of trends in rents, lease terms, prices for land, construction costs, etc. Get the best opinions of values and cost that you can. Focus on projects that show promise. Realize that some development ideas just won't work based on market expectations. Potential value resources: assessor, appraisers, realtors, bankers, department of revenue (industrial). Potential cost resources: appraisers, contractors, engineers, architects, city engineer. • Know the difference between needing and wanting TIF. 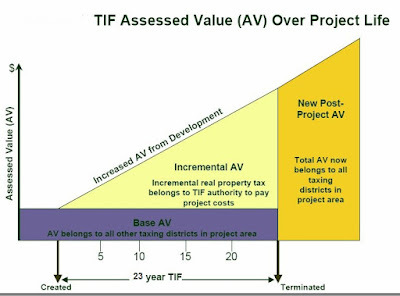 “But for TIF, the developer will walk” is not the best “but for.” Prove they NEED it. a duty to protect schools from being harmed by such TIF abuses.